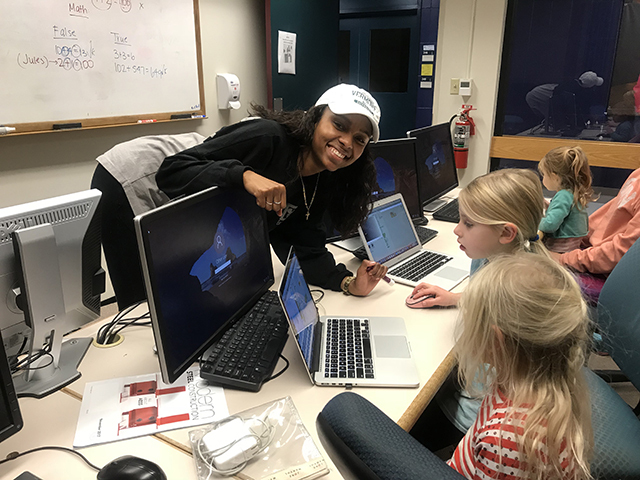 Student Nikki Allen teaches young girls to code on Friday afternoons. Now, Allen is sharing that sense of discovery with girls as young as 4 as she devotes a few hours each Friday. Yes — 4-year-old Julie and her older sister Kyla, 6, are already learning to do much more than drag, drop thanks to their computer science lessons with Allen, for which they travel from Charlotte to the UVM campus. Having attended Collegiate Institute for Math and Science, Allen was naturally inclined toward an interest in STEM, and has several internships to prepare her for her career after college. She’s worked with Girls Who Code (GWC) on its goal to reach 1 million by 2020, and has also been a GWC teacher’s assistant. Her favorite stint, however, was serving as a software development and editorial intern for AOL-owned Cambio.com. “I was able to perform tasks and see immediate results,” she says.